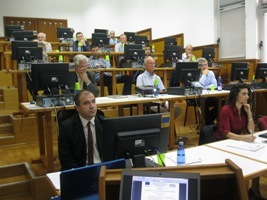 10 October 2014 – The Faculty of Mechanical Engineering in cooperation with the Union of Municipalities of Montenegro organized the second pilot course “Management of the Renewable Energy Sources”, on Friday October 10th 2014, in the building of the Technical Faculty in Podgorica. The project aim is to establish cooperation between the Faculty of Mechanical Engineering and the Union of Municipalities of Montenegro based on a special web platform www.sd.train.ac.me/moodle, in order to make information available to the officials who deal with energy management at the local level, to improve their knowledge and skills necessary in the performance of duties and tasks related to the enforcement of legal obligations prescribing rational use of renewable energy. The first course with in the project on “Energy Efficiency in Public Buildings” was organized and attended by energy managers from most local governments, in February this year. Mr. Danilo Barjaktarović, Advisor in the Ministry of Economy, as a representative of the department responsible for the implementation of policies in this area, presented the legal framework for both state and local levels. He pointed out the necessity of revision of some solutions and simplifying administrative procedures that will contribute to the more efficient management and the use of renewable energy sources. The course is delivered by eminent experts in the field of energy efficiency: Mr. Radoje Vujadinović, PhD, professor Mr. Igor Vušanović, PhD, professor Mr. Uros Karadzic, PhD, professor Mr. Peter Vukoslavčević, PhD, professor Mr. Vladan Ivanovic, PhD, Mr. Milan Sekularac, MA, and others. They presented potentials of Montenegro related to the various sources of renewable energy such as wind energy, solar energy, geothermal energy and biomass. A special attention is given to hydropower and plans for the construction of small hydropower, which along with the solar energy is the greatest wealth of renewable energy. Participants have been introduced with the example of good project management construction of small hydro “Vrelo” in the Municipality of Bijelo Polje. All participants agreed that it was necessary to improve information for the public and local governments about the possibilities of using renewable energy sources.